It's rare a hotel redesign improves what was there before, so all credit to the Savoy hotel in the Strand. Its £220m refit is a triumph. The entrance, the lobby, the American bar, the Beaufort bar, the Thames foyer are all hugely elegant, well lit, as near perfect as anything can be if it isn't me. 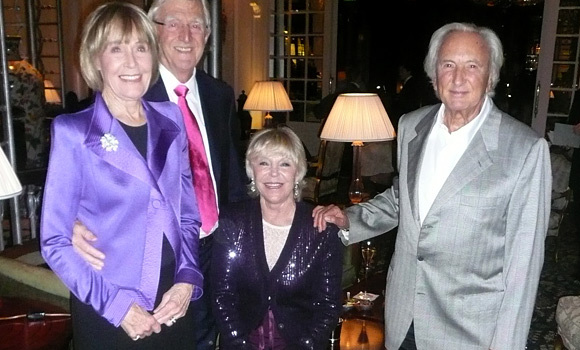 So when Sir Michael Parkinson, his wife Mary, Geraldine and I entered the River restaurant we hoped for the best. Got the worst. Mary said, "It looks like a Japanese restaurant." The view has been decimated. Two silly, black, shiny annexes face the river; the windows are minimal; the main restaurant an off-white monstrosity. The food and service matched the venue. No one asked if we wanted more champagne even though our glasses, brought in from the Thames foyer, faced us empty. It took forever to get menus, and when we did get them, no prices were visible. A waiter explained the numbers after each dish, minus a pound sign, were the prices. "In Chinese restaurants they have numbers for each dish - that's what it's like," said Mary. "I nearly ordered two 17s, a 26 and a 42." I had bottled water. A quarter of an hour after asking I got ice and lemon slices. When I complained the ice would melt in a shallow bowl, the waiter said, "I wanted to bring it quickly." "Fifteen minutes to produce ice is not quick," I said with frigidity. Apart from Geraldine's gluten-free bread, which came speedily, no one got bread, butter, anything. After 20 minutes I got up, found someone and made my feelings known. The restaurant manager, Eike Bosche, who'd greeted us briefly, had vanished. The staff and service lacked precision, rhythm and energy. It was the worst-run restaurant ever. Only after I complained did things move fast. Michael and I had tasteless brown crab cakes, mysteriously on a bed of mashed potato. Mary liked her smoked salmon, Geraldine her scallops. After that no one liked anything. My pan-fried sea bass fillet in parsley crust looked like a sausage, was dry - the whole plate, including vegetables, bland beyond belief. For dessert I was tempted by (although fearful of) the steamed gingerbread pudding. The waiter recommended dark chocolate sorbet with espresso granite. I had both. The gingerbread pudding was sticky, heavy, inedible. The chocolate sorbet was good. Man cannot live by sorbet alone. Friday night is a ropey night for guests (none ropier than me) but this crowd was beyond belief. At the adjacent table two men were in shirtsleeves, one had a pullover. The Savoy used to be elegant. Many guests looked like vagrants who slept in nearby doorways. Why not insist on jackets for the men? The next day on Twitter, Serlthegirl tweeted, "Just back from the River restaurant at the Savoy. Michael Winner in a strop at next table. Awful restaurant." Michael Parkinson summed it up: "It was not a distinguished meal." Kiaran MacDonald, the general manager, says in the hotel brochure, "The Savoy looks for perfection in every detail." Looking ain't enough. Fairmont hotels should redesign the River restaurant and fire everyone in it. Including the guests. It's now up to Gordon Ramsay's Savoy Grill to save the hotel's food reputation. That's assuming Gordon can save himself. PS: When I phoned the Savoy to make a reservation the phone rang for 4min 30sec. I rang off, tried again. After 6min 15sec it was answered. More than 10 minutes to get through. The hotel brochure boasts that Fairmont's restoration of the Savoy would have the hotel "bestride the 21st century". Enough staff to answer the phone might help. I told you my Essex girl PA, Natalie, went to the website Sugardaddie.com and came in with a £35,000 diamond ring, a diamond necklace and other goodies. She said her sugar daddy bought her a new BMW 4x4, a house and more. I never believed it. I had the head of Sotheby's jewellery ready to examine the ring. Natalie refused to let my chauffeur take it in. The man, who said his name was Mark Casperman, was in her flat when £3,000 disappeared; her parents lost about £9,000 in a Casperman scam. Turned out he was a multi-convicted fraudster, who'd just served 4½ years in jail. He offered Natalie the same £1,000 I pay for a five-day week, for a three-day week. So she left. Luckily we found Sarah Shawcross, a great PA. Natalie comes in occasionally to help out. Girls, resist Sugardaddie.com. As for Nigel Havers's miserable showing on I'm a Celebrity ... Fancy having a near breakdown, blathering his wife would leave him if she saw him in prison costume in a jungle toy jail. Must be a pretty dysfunctional marriage. Not as dysfunctional as Nigel. He took the money, behaved abominably and let actors down. My hairdresser said Nigel quit because the rain was washing out his hair dye and his roots were showing. The other jungelees were great fun. Except for Dom Joly. I'm fun on Fortnum & Mason's first floor, 1pm, December 9 for book signing. Come and see me. You said last week when your photo wasn't used, "Thought you'd prefer the ladies." Why this sudden consideration for your readers? We've put up with your photo for years; a few more won't harm. I'm surprised the Metropole in Brussels didn't keep the trousers you left behind as a memento and proof of your stay. Just bought your new book. What a brilliant, unbelievable door stop it makes. Please send a dedication to stick in it anyway! Letter-writer Mike Crow shares our dreadful experiences at Churston Court Inn, Devon. Its Sunday roast lunch was served on greasy plates with only a half dried-up turkey breast. When I complained, a dirtily clothed chef appeared to growl: "I only get £17k a year!" What possessed you to have a go at lovely Nigel Havers? Are you jealous of his wonderful, melodious voice, his suave good looks . . ? An elderly man is stopped by police at 1am and asked where he is going. The man replies, "I'm going to a lecture about alcohol abuse and its effects on the human body." The policeman says, "Who gives that lecture at this time of night?" The man replies, "My wife."